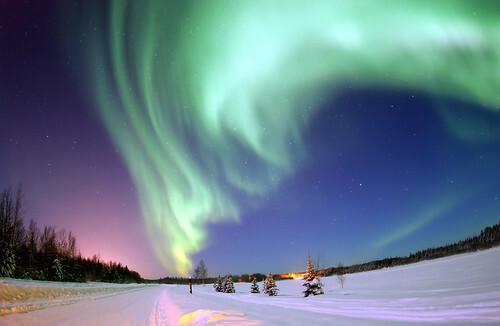 Aurora Borealis, the colored lights seen in the skies around the North Pole, the Northern Lights, from Bear Lake, Alaska, Beautiful Christmas Scene, Winter Star Filled Skies, Scenic Nature, a photo by Beverly & Pack on Flickr. I won't accompany this photo with many words because I've said on here before - more than once I would imagine - how much I really want to see the northern lights. I can't resist showing you this magical photo though as the light and the colours are just beyond beautiful. The purple glow on the snow is just amazing. Amazing! One day I hope to see these lights happening. Oh one day I will too! It would just be amazing.